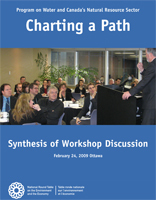 On February 24th, 2009, the National Round Table on the Environment and the Economy hosted a workshop entitled “Charting a Path: Water and Canada’s Natural Resource Sectors”. The NRTEE solicited advice from close to 50 stakeholders from across Canada representing the natural resource sectors, academia, Aboriginal, non-governmental organizations and governments. The aim was to inform the NRTEE on where it could provide the greatest value and to confirm the key current and emerging issues and opportunities in the interface between the natural resources sectors, climate change, and water use. Based on the advice from participants it was confirmed that the NRTEE is well positioned to take a leadership role – as a catalyst and convenor – to work with stakeholders to determine a path towards sustainable water use by the Canadian natural resources sectors. A key message pointed towards the need to identify first what science, knowledge, data and information already exists and how that information can be disseminated through the NRTEE’s recommendations. Governance issues also appeared to be a common concern amongst workshop participants. President and CEO David McLaughlin closed the event by affirming the NRTEE’s desire to continue to focus attention on the issue of water resource sustainability and the sustainability of our natural resource sectors.